A good sauce can make or break a dish. If it’s too thin, it may be lacking the depth and flavor needed to take your meal to the next level. One option is to continue cooking the sauce, but then you run the risk of burning or overcooking it and throwing off the flavor of your entire recipe. But, a simple ingredient that nearly everyone has in the kitchen pantry can help you turn a good sauce into a great one. There are three main techniques that you can use to thicken a sauce with flour: a flour slurry, Beure marnie, and a roux. In this post, we will review the steps required to use all of these thickening methods. Follow these instructions to thicken any type of sauce in no time and be on your way to a tasty meal. If you completely new to thickening sauces, flour is a good place to start. It is a staple in almost every kitchen and inexpensive to buy. These instructions are based on using all-purpose flour, but many other types are now on the market for gluten-free diets. It’s possible to use gluten free flour, but you may need to adjust the flour to fat ratios to achieve the consistency you desire. Flour is a great option for thickening because it has a velvety, creamy mouth feel and adds more body to sauces. This makes it ideal for rich or cream-based sauces, as well as soups and chowders. But if it’s undercooked, flour can also leave an unpleasant taste in your sauce. Think about it — would you want to eat flour on its own? I didn’t think so. How does the thickening process work? All-purpose flour mainly consists of starch, in fact 75 percent of it is made up of starch. These starch molecules absorb water and under the right amount of heat swell up and burst, releasing a gel like substance that acts as the thickener. However, this is an irreversible process, once the water has bonded with the flour and gelatinized, there’s no going back. The general rule of thumb is 2 tsp. of flour for every quarter cup of liquid. This can vary depending on how thick your sauce is already, and how thick you want it to become. As I mentioned earlier, there are three main ways to thicken with flour, a flour slurry, a Beure marnie, and a roux. Let’s take a closer look at the steps for each option. The flour slurry is the quickest and easiest way to thicken a sauce using flour. Use this method if you are short on time, or if your sauce does not require much thickening. 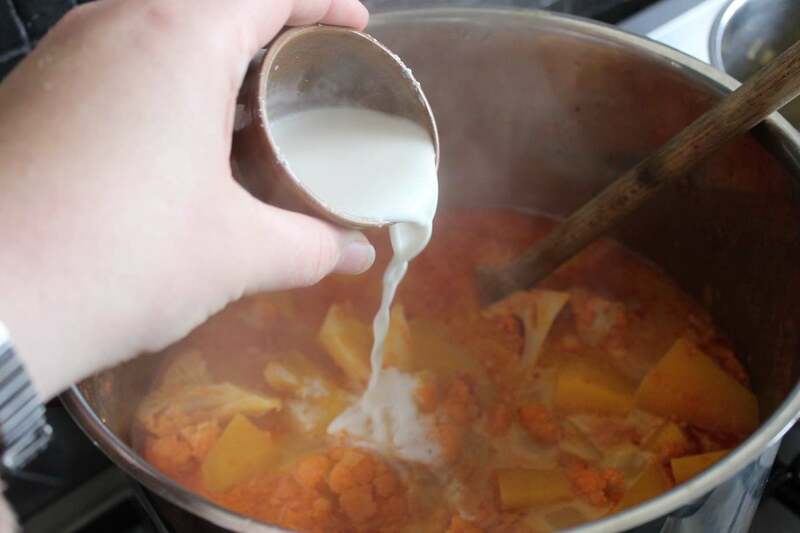 Flour Slurry – Photo from divine-recipes.comStir the slurry into your sauce, bring the mixture to a simmer, and let it all cook together for at least 5 minutes to get rid of the raw flour taste. Stir as needed if you see clumps starting to form. Photo from soulfoodie.netIf the sauce is not thick enough, repeat these steps with another round of flour slurry until your cause reaches the desired consistency. The next option is a Beure marnie, which means equal parts butter and flour kneaded into a ball This method is ideal for thickening small amounts of liquid, like a pan sauce. This sounds fancy, but is very simple to make. You can either make small amounts by hand, or use a food processor to make larger quantities and store them in the freezer for later use. Follow these simple steps to make your own. Measure out 1 tbsp. each of flour and softened butter. It’s important that the butter is at room temperature, otherwise it will not mix. Mix together with your hands or a fork until a smooth paste has formed. Roll into a ball and add to your sauce. The cooking time with a Beure marnie is not quite as long because the addition of butter reduces the cooking time needed to get rid of raw flour flavor. Bring to a simmer and cook for at least 3 minutes, or until your sauce reaches the desired consistency. The final way to thicken a sauce with flour is by making a roux (pronounced “roo”), which means equal parts flour and fat. The difference between a roux and a Beure marnie is that the roux is cooked separately before it’s added to a sauce. A roux is most commonly used in thickening soups and gravy-like sauces it is most commonly made with butter, but olive oil, vegetable oil, or rendered animal fat can also be used. There are four different types of roux: white, blond, brown, and dark brown. The darker the color, the longer the roux has cooked and the more flavor it has before being combined with the rest of the sauce. Darker rouxes are most commonly used in Cajun dishes like Jambalaya, while white and blond are used in soups and chowders. No matter what type of roux you want to make, the process for doing so is the same. The only difference is cooking time. 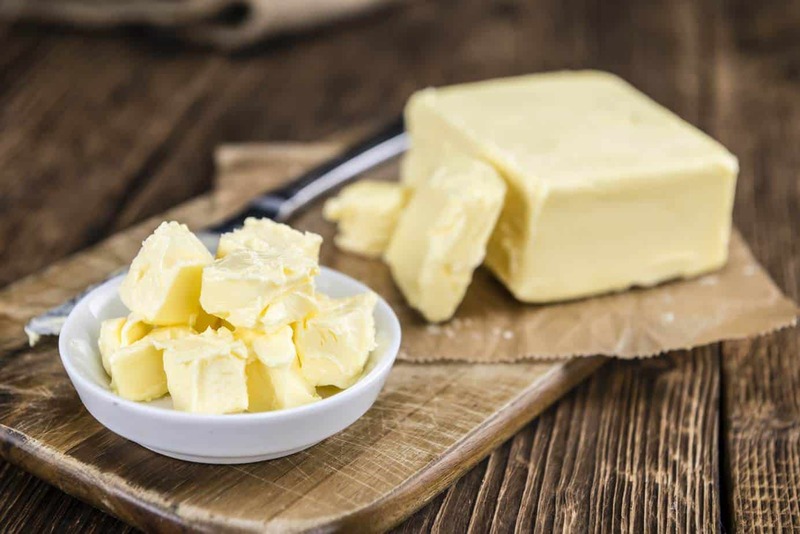 Melt 1 cup of butter in a saucepan over medium heat. 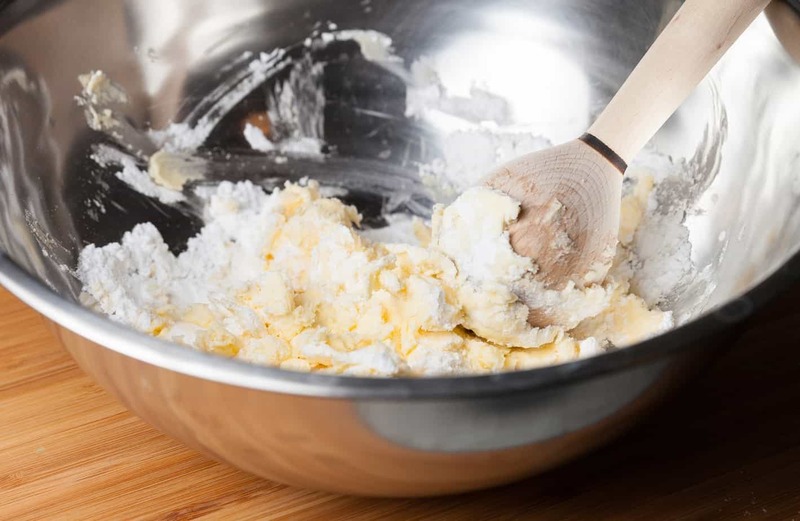 Test whether the butter is hot enough to sprinkling small bits of flour into it. If the butter starts to bubble, you are ready for the next step. How to Roux – Photo from craftsy.comWhisk 1-3/4 cups of flour into the butter until a rough paste forms. Whisk constantly while it bubbles over medium heat. If you stop whisking, the roux will clump up and burn so constant stirring is important. As it cooks, the roux will become smooth and begin to thin. 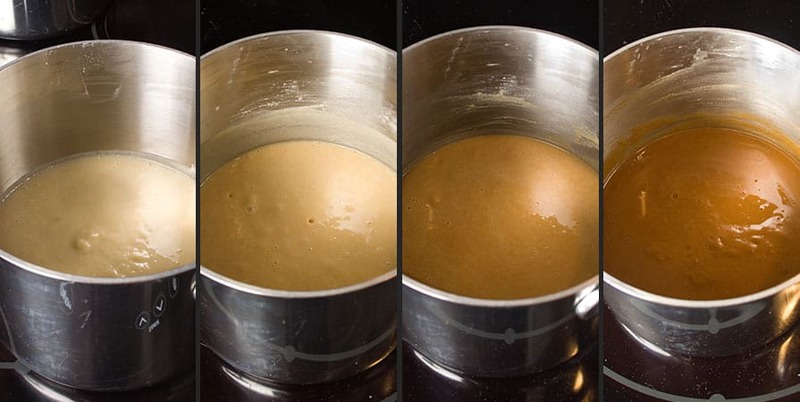 Photo from thekitchn.comThe roux will reach white stage after about 5 minutes of cooking and stirring. The flour will have lost its raw taste, but the mixture will still be slightly grainy in texture. The color will be a little paler than when the flour and butter were first combined. 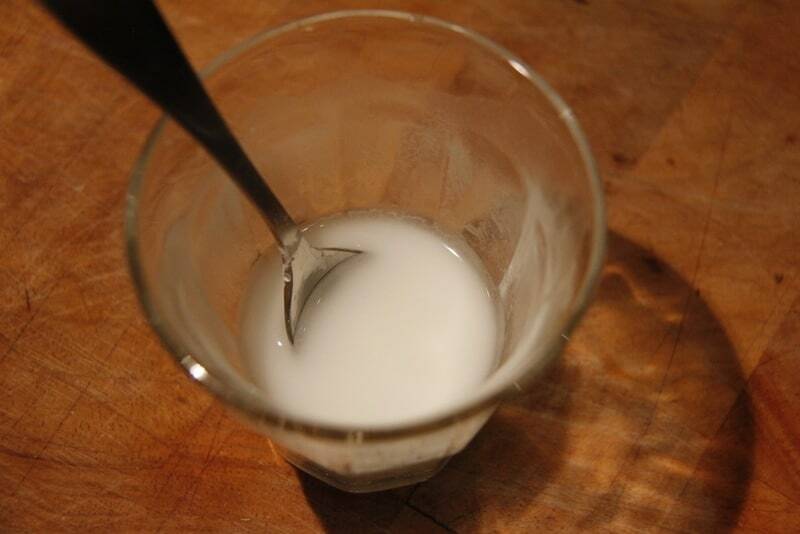 The roux will reach white stage – Photo from gustosuperiore.itAfter about 20 minutes, the roux will reach the blond stage. The bubbles will begin to slow, and it will begin to smell like popcorn or toasted bread. The roux is now tan colored, very smooth, and thinner than it was at the white stage. Blond Roux – Photo from escoffierathome.comBrown roux will reach a peanut butter-brown color after approximately 35 minutes of cooking and stirring. Its aroma is more pronounced and sharper than the nutty nuances of blond roux. The roux is now thinner, and the bubbling has slowed even more. Even darker than brown roux, the dark brown stage occurs after about 45 minutes of cooking. The roux will have achieved the color the color of melted milk chocolate and it may even smell a little like chocolate. It will no longer be bubbling, and its texture will be much thinner. Although a roux is the most time consuming method for thickening a sauce using flour, the complexity of flavor achieved makes it well worth the wait and the effort. Any of these methods will result in a thicker, more flavorful sauce. The method you choose should depend on what type of sauce you are making, and how much time you have to spare for the thickening process. The recipe you are using may also dictate which technique is preferred, and offer more specific instructions on what to do. If this article has helped you make a better sauce, please share it so your fellow cooks out there can improve their sauces too!